A while ago I ordered some new toys for me to play from dawanda. 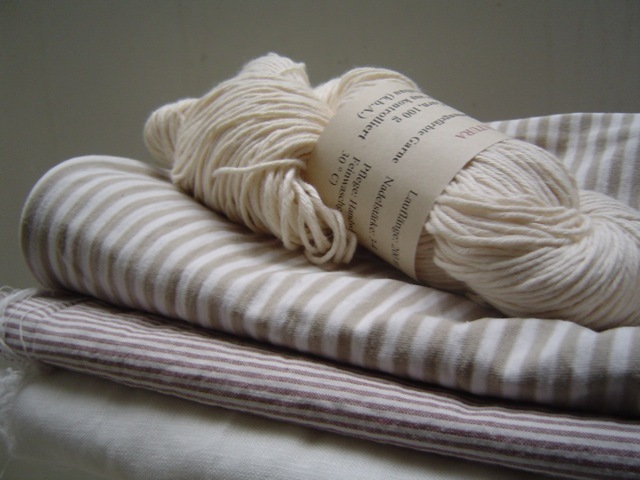 Organic cotton, linnen and organic cotton yarn for kniting. I can’t wait to dig my hands into those treasures and creaft. My creative juices are flowing. nice natural colors. i wonder what you will make. Oh new supplies and fabrics are always such a joy. I have the hardest time finding fabrics I like here in rural france, all I can say, is thank goodness for online shops. But still it is difficult.